Ditch the boring dips and go for something a bit more exciting. The Southwest Banana Peppers Dip, made with our mild banana pepper rings, is a yummy, zesty treat that is perfect for veggies and chips. It is the perfect treat for a family get together, picnic, girls nights, watching the game, bbq, or just chilling with a movie. Ok. We’ve all been there. What do you give people to snack on before the big meal? You’re not ready for the main dish, but you want people to have something yummy before the main event. So, you check out the options. The pre-made dips that they sell at the grocery store are pretty bland. Honestly, what are they made out of? It is like some kind of gelatinous, unhealthy blob. You decide to go homemade. But if you make something, you don’t want to go with the same old ranch dip or seven-layer-dip. It has all been done before. It tastes good, but it honestly isn’t that exciting. So why not try out something a little out of the ordinary and a lot of delicious? 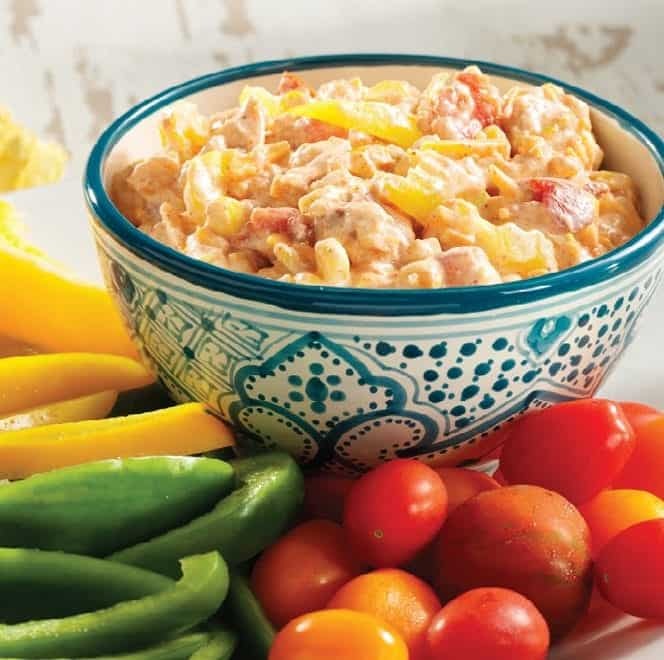 Southwest Banana Peppers Dip brings you a little of everything: creamy sour cream, sweet corn, tomatoes, and a nice bit of spice with the taco flavor. Oh, and don’t forget the cup of shredded cheddar. When I saw sour cream and a cup of cheddar, I knew this one was a winner. Those are basically my love language for food. My mouth is literally watering just looking over the recipe. Let’s just say you might want to double or triple the recipe so that you can share it with your guests. The highlight of this dip is the banana peppers. It took me a while to try banana peppers, but when I did, I was hooked on the sweet, tangy, bit of deliciousness. Some people see “pepper” in the name and instantly think spicy, hot, burning pepper. Not this pepper. It is more like a sweet pepper with a little bit of zip. And, it is addictive. It enhances pretty much anything you put it on. As a new fan of banana peppers, I knew I had to try this recipe. Prep is a breeze, just make sure to buy the pre-shredded cheddar cheese (life-saver). Just chop up the pepper rings and then stir everything together and you’re good to go. In the summer, you could substitute in fresh tomatoes and corn to amp up the flavor. It works great with chips, nachos, crackers, and fresh veggies. I would recommend getting some of those toasted baguette slices. You can pile it high because they provide a good solid base that won’t crumble. With this, you can avoid the boring dips and go for something a little more exciting. So the next time you go on a picnic or just want something to munch on while watching a show, whip up some Southwest Banana Pepper Dip. Store in an air-tight container and refrigerate until ready to serve.